While chasing Auric Goldfinger (Gert Fröbe), James Bond (Sean Connery) encounters Tilly Masterson (Tania Mallet) in her white Ford Mustang convertible. 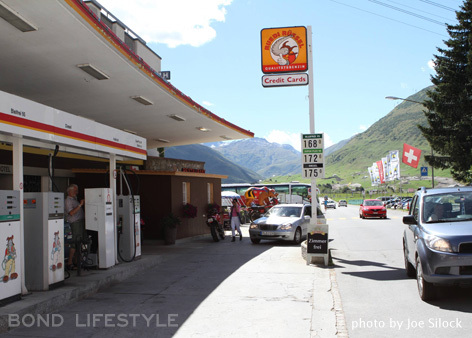 After he sabotages her Ford Mustang with the tire shredder of his Aston Martin DB5, he offers to help her and brings her to the nearest gas station, this Aurora gas station in Andermatt. Tilly calls for help from here and even though Bond offers her to drive to a hotel, she declines his offer and watches him drive away. As can be seen in the image above, the gas station is attached to a building, now hotel Aurora. The time has come to update the gas pumps, but the owner of the hotel and gas station has decided it is not worth it to do the repairs and maintain the gas station. 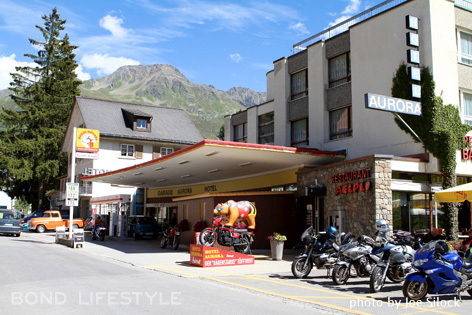 The plan is to create a new entrance to the hotel at the location of the gas station, so be quick to plan a trip if you want to see the gas station before it is demolished. In 2009, car magazine Octane re-enacted the Goldfinger chase with a Ford Mustang, Aston Martin DB5, Rolls-Royce Phantom, and Bond Girl Tania Mallet. The fantastic photoshoot by Tom Salt can be found on the Octane website and Facebook page, including some great photos of Tania Mallet at the gas station with the DB5.